I recently received an astrology question that I felt worthy of a fleshed-out answer. So, it’s time for another installment of the Q & A blog series. Question: I’m not trained in astrology but I’m curious about why it is that astrologers seem to stay fixated on the natal chart? Wouldn’t that just be a snapshot of what you entered this plane of existence with? Or would the progressed chart be more of what you have the opportunity to develop internally?? I’m just thinking about how transit charts are usually drawn up in relation to the natal and not the progressed. You came to mind during these intuitions so I thought I’d ask what your reflections or thoughts are about that. Answer: I appreciate your thoughtfulness and questioning of convention. The layers of your questions here beg for unpacking. In my astrological pursuits, I’m always trying out ideas to see how/if they work, and really I would recommend you do the same here. Try comparing transiting planets to your progressed chart, and see if something clicks. Certainly it won’t work the same as transiting planets around the natal chart. But perhaps something of value awaits you there. I look at the progressed chart as an unfolding of a person’s greater life narrative. The energies presented there definitely touch on personal evolution sprung from within, but just like astrology as a whole, they also reflect one’s narrative outside of inner life. I’ve seen health issues culminate and relationships come in, as well as rises to prominence and shifts into hermitude in progressed charts. My main resource on how to approach progressed charts is Bernadette Brady’s amazing book on predictive astrology The Eagle and the Lark. She is so incredibly thorough and attentive. And I recall her asserting that one’s progressed chart does not receive energetic influence from transiting planets. I had the same curiosity as you, but I decided to blindly trust her. She is so convincing! Or perhaps to give myself some credit, my inner being knew she was right, as I had some feint recollection of experimenting with it myself. This doesn’t mean that you aren’t being pulled to look into this for some reason. A tri-wheel of author’s chart. From outermost: current transits; progressions; natal chart. Astrology was not always fixated on the natal chart. It developed very slowly, as the planets facillitated. And most astrologers/astronomers were concerned with the stars’ bearing on their collective/tribe/community moreso than on the individual (this is called “mundane astrology” in current language). I suppose times have changed! The first natal chart was drawn a little over two millenia ago, and now, natal astrology has taken over the entire field, aside from small interest in mundane, horary, and electional astrology. It makes sense, given all of the healing we need on the individual level at this time, perhaps in order to progress into some newly tinted ancient ways of living (it helps me to idealize the future). There is so much work to be done toward healing the planet, but I believe it has to start with the self, otherwise one’s work will be rendered ineffective by their unaddressed pain. And yes, the natal chart is exactly a “snapshot of what you entered this plane of existence with.” A moment chosen by the higher self. We are born and develop into some version of the being reflected in that soul map, and the fully actualized self is the one who is most integrated with it. Why does it work when we compare transiting energies to this snapshot? Within the current knowledge paradigm, we can’t answer this with certainty. I started studying astrology as a doubter, but very quickly I grew comfortable with its built-in leaps of faith. So, generally, when I’m asked any number of questions about why astrology does this and that, instead of some other thing (and the debate goes on and on, even among astrologers’ nitpicking of techniques and house systems), I tend to encourage exploration. Because a lot of stuff works. And sometimes, a technique clicks and makes sense to one person, while to someone else it’s a jumbled mess. Astrology is a form of divination, and we ourselves are divine. There could be infinite applications! Just seek with reverence and the planets will respond. 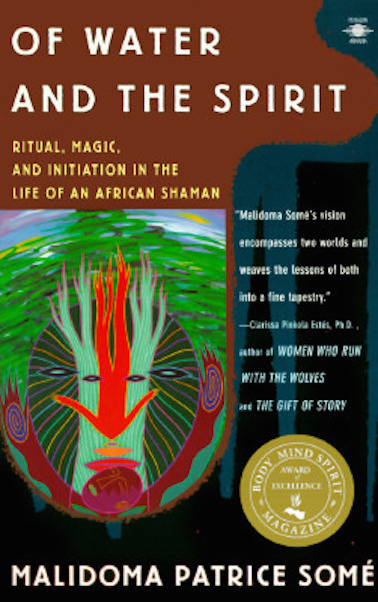 I recently read the outstanding and revelatory book Of Water and the Spirit: Ritual, Magic, and Initiation in the Life of an African Shaman by Malidoma Patrice Some. The book is an autobiographical narrative which gives amazing details on Malidoma’s adolescence and initiation into adulthood in the Dagara tribe in Burkina Faso. As Malidoma begins his initiation, gathered around a fire with a group of other young tribesmen, a Dagaran elder offers the brilliant teachings of their tribal concept of the circle. As I read this, I was immediately struck by the insights provided into astrology’s layout of the birth chart, and specifically the four angles or pivots around which the birth chart is arranged (Ascendent, Midheaven, Descendent, and Anticulminate). The elder’s teaching is paraphrased by Malidoma and then translated from Dagaran into English—an amazing feat in itself—and was delivered to the Dagaran initiates seated around this fire in the mid-1970s. 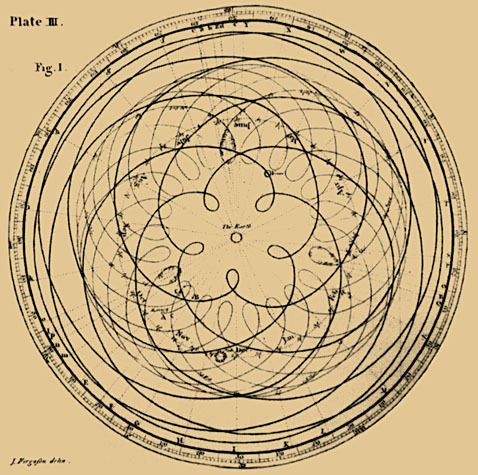 Roughly, the birth chart is a circular astronomical map capturing a moment in space and time, with the center of the circle being the native in their birthplace. Imagine the native lying on her back, feet facing south. If she rolls to her left, she will see the eastern horizon, or the ascending point. Rolling to her right, she will see the descending point. All that is below the native is shown in the lower half of the chart, and all that is in the sky is shown above the Ascendent/Descendent axis, or horizon. When interpreted, the chart’s tellings are a reflection of the native in the center. If the declination of Mars in a chart is greater than 23 degrees and 27 minutes north or south, this is considered Mars out of bounds. So what can this tell us about a person? When Mars is out of bounds in a birth chart, the martial energies can appear quite evolved if Mars has been properly worked with. Or, when left unaddressed, these energies can appear rather depraved. For better or worse, Mars out of bounds is very empowered by its positioning outside of the ecliptic’s borders. When Mars out of bounds is further bolstered by a strong placement in the birth chart—on the ascendant, midheaven, or descendent, in a dignified (Capricorn, Aries, Scorpio) sign, or in positive angular relationship to another strong planet—well, watch out, world. Tied to trauma which is often associated with early life or past lives. Sign placement is indicative of collective trauma that you are a part of. Chiron’s relationship with other planets represents your personal traumas. Chiron is NOT YOUR FAULT. Trauma has been shown to affect your actual DNA. Trauma could be ancestral or from past lives. Chiron calls for action from the person or collective. Otherwise, chronic pain. Moving with Chiron energy means engaging the parts of you that your trauma touched/weakened. Chiron asks us to work toward the position of inspirer for others to make similar steps. The healing journey is neverending. I received an e-mail question from a client recently that I found myself answering very thoroughly. Ever since I have been “out” as an astrologer, people have expressed their reservations about an inherent lack of Free Will in astrology. This is part of a bigger problem of astrologers presenting the planets as causing events or feelings, rather than reflecting what is occurring. I could go on about the root of this instinct being lip service to the current patriarchical scientific paradigm of “knowledge”, but let’s just talk about free will, determinism, and astrology for now. Sometimes I have a perception of astrology as foretelling things that have already been written with little room for free will. This just isn’t actually very helpful or empowering for me. I’m curious about your approach to a life overview reading, and what your thoughts on free will vs. determinism are. First off, let me say that I love receiving e-mails like this. E-mail me about your issues or questions with astrology! Is Santa Claus Out of Bounds? I know out-of-bounders are often not so keen on big consumer-driven holidays. But when I think about it, even without seeing a birth chart, I am pretty sure Santa Claus has some out of bounds planets. He lives way, way outside of normal society. Nobody dressed like him, until him. Now, imitators everywhere. Santa has created his own form of economy, where he only accepts milk and cookies. Santa Claus is not straight, and there’s a song about it. If the declination of Venus in a chart is greater than 23 degrees and 27 minutes north or south, this is considered Venus out of bounds. So what can this tell us about a person? In astrology, Venus works as a symbol for a myriad of concepts: personal values, aesthetic tastes, patterns in relating both romantically and in friendship, the divine feminine, nature, women’s rights, financial standing… the list goes on. In the physical realm, Venus can represent women, cats, the kidneys, the arts, sweet foods, parties, certain crystals and flowers. Venus is a benefic planet, and generally brings in positive energies. But Venusian influences can often be over-indulged. Cue Libra, a Venus-ruled sign known for its fixation on balance and harmony. The spoils of Venus are best enjoyed in moderation. from James Ferguson’s Astronomy Explained Upon Sir Isaac Newton’s Principles, 1799 ed., plate III, opp. p. 67. So if Venus can show up in so many different avenues of our lives, how can we pinpoint and illustrate the Venus out of bounds signature? Well, to begin, Venus out of bounds simply does not operate within cultural norms surrounding relationship, art (creation of and taste in), or pleasure. 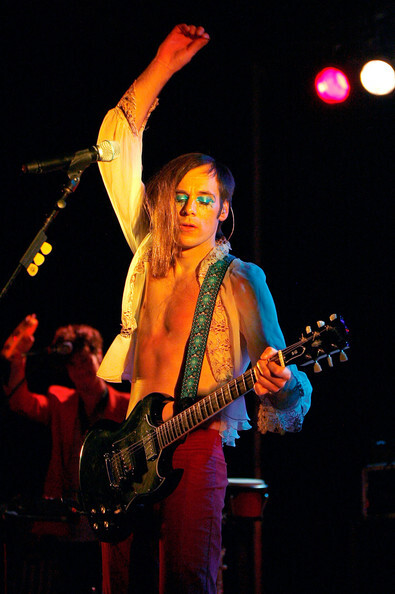 Perhaps you are familiar with Kevin Barnes and Of Montreal, the art-rock/funk/indie band formed by Barnes in Athens, Georgia, in 1996. 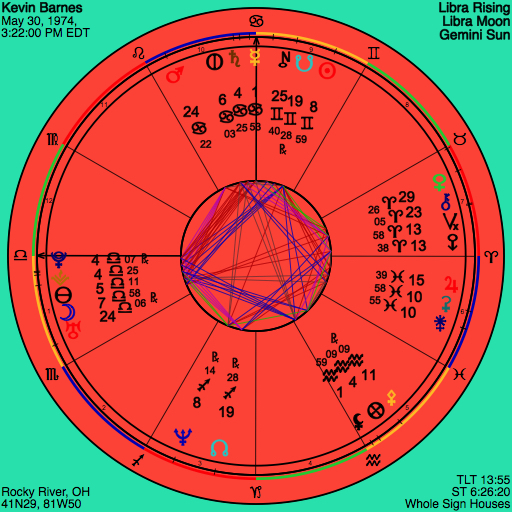 The focus of this post is Barnes’ Mercury, which you can see in the chart above–right at the top, at 1 degree Cancer. And of course, way out of bounds. For a planet to be classified as an out of bounds planet, it must be traveling through our sky at a remarkably high or low angle along the ecliptic–the path created forged by the Sun and Moon, occupied by the zodiacal constellations, that one strip of sky through which the first astrologers noted that stars were moving. The “bounds” are determined by the Sun’s north-and-south range along the east-to-west ecliptic. Go outside for your next visible sunset and mark where the Sun touches the horizon in the west. Some time later (a week, a month, three months), stand in the same place for sunset, and you will notice that the Sun’s descension point is either further north or south than when you first saw it. For us living on the northern hemisphere, the Sun is at its northernmost on Summer Solstice, and southernmost on Winter Solstice. The path of the Sun on these polar days creates the “bounds” of the ecliptic, measured at 23.3 degrees north or south (+ or -) in a common declination table. And so, when a planet is traveling along the ecliptic but outside of these bounds, that planet is designated as out of bounds. This tends to occur almost exclusively within the signs of Gemini, Cancer, Sagittarius and Capricorn–the signs bookending the summer and winter solstices. This is a very surface-level explanation of the mechanics of out of bounds planets. And as much as I enjoy the astronomy realm of astrology, I’m more interested in relaying information about meaning here. So, if you feel the need for a deeper understanding and great visuals, go over to Nick Anthony Fiorenza’s The Lunar Planner and learn more. You or someone you know has an out of bounds planet, but what does that mean? Meaning! It’s what makes astrology astrology. Really, each out of bounds planet shows its quirky characteristics in specific ways, but there are some thematic commonalities from the Moon on out. For instance, the scofflaw trait. In locational astrology, a paran is a line that circles the earth latitudinally. Each paran has an origin point: a location where two rising, setting, MC or IC lines intersect. It is from this parallel that the paran line emerges east and west, like a ribbon around the globe. Any paran’s orb of influence is up to 2 degrees north or south of the line. I recently left Minneapolis, MN, on the 44th parallel North, where I lived for 18 months. I have a Mercury rising/Pluto rising paran passing right through Minneapolis, and learned a good deal about what this meant for me by living there and observing its influence. 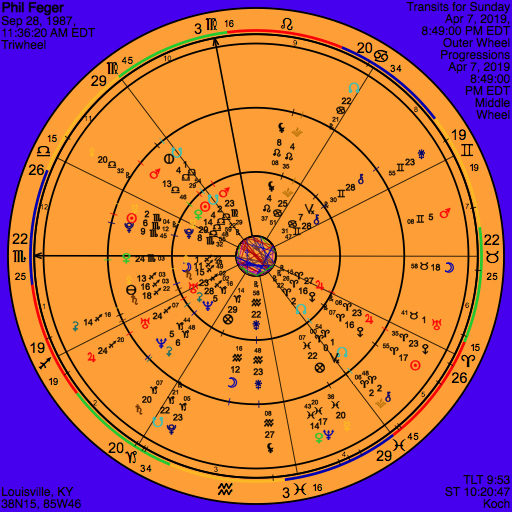 Phil Feger is a professional astrologer and the vision and voice behind Out of Bounds Astrology. 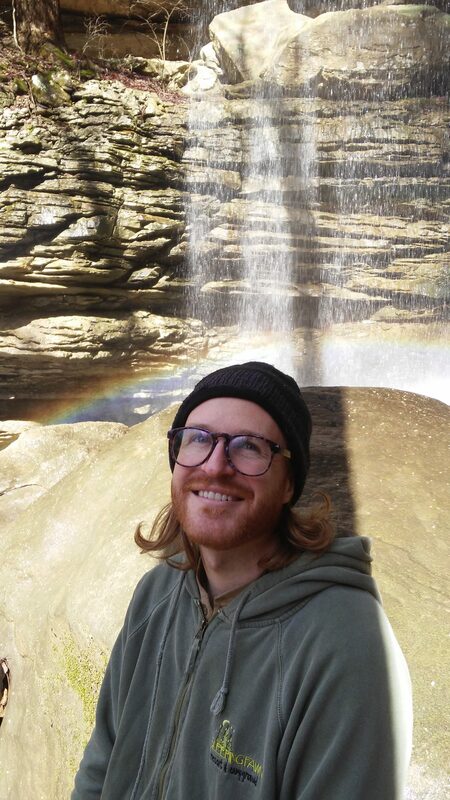 He lives off the grid in Disputanta, Kentucky.